I started my sailing endeavors in the Optimist Dinghy at age 8. However, it wasn’t till I decided to dedicate my life to the sport at age 12 that I started to win titles. 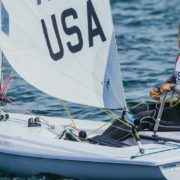 In the Opti, I won two consecutive Girl’s National Championships, placed 4th in the Coed National Championship, and qualified to compete all over the world for my country giving me experience to international competition at a young age. 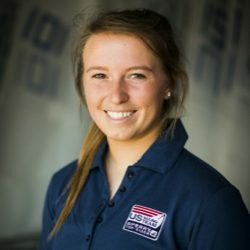 Moving up from the Opti, I was inspired to pursue a career in the Laser Radial due to two strong influences and coaches, Anna Tunnicliffe (2008 Beijing Laser Radial Gold Medalist) and Brad Funk (2009-2011 Coach and current olympic campaigner in the 49er). In the Radial, I qualified to represent the United States in the 2010 ISAF Youth Worlds in Istanbul, Turkey bringing home a bronze medal. Shortly after Turkey, I traveled to Largs, Scottland where I won my first ILCA Youth World Championship. The next year I qualified again for the ISAF Youth Worlds in Zadar, Croatia, this time bringing home a silver medal. Later in 2011, I was able to defend my title as the ILCA Youth World Champion making it my second World Champion title. Additionally, that year I competed in and won the United States Youth Championship consisting of the top sailors in the country from age 15-19. In 2012, I was able to solidify a third World Championship title in Boltenhagen, Germany in the U21 Division while placing 8th overall in the Women’s Division. Moving out of the youth circuit in 2012, I went on to pursue College Sailing goals at Boston College with Coach Greg Wilkinson. During my three years there, I learned how to be teammate, leader, and champion. In 2015, my team pushed me to become the first person ever to win the Singlehanded National Championship for the third consecutive year. 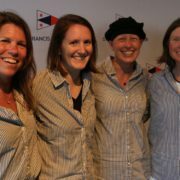 Throughout my college sailing career, I was a three-time Quantum Women’s Sailor of the Year Finalist, three-time Women’s All-American, and received recognition as an Honorable Mention in the Coed Division. Other accolades received at Boston College include three-time Women’s Team MVP and a Leadership Award from the Athletic Department. After a year long deliberation with US Sailing Team Sperry, as well as the Boston College coaching staff and teammates, I decided to take my senior year off to be able to fully pursue my olympic campaign. Even though leaving school and my teammates was the hardest decision I have made yet, I know it was a necessary step to take. I will return to finish out my degree in Environmental Geosciences in the fall of 2016 and have another shot at winning a national title with my team. I have learned how to be a disciplined athlete during my three years at Boston College and I am excited to show what I have learned on the water. There is nothing I want more in this world than to bring home a gold medal for my country. I have had this goal since I was 12 and it has never once left my mind.